Help Prince Charming climb Roberta's hair to rescue his fair maiden from the clutches of an evil witch. Click here to play! If you can manage to give this fairy tale a happy ending, you'll be rewarded a princely prize. Prince Charming is the main character in this storybook. If you can spin him five times, he'll pay out 1500 times your original line bet. He also substitutes for other symbols and doubles prizes in all winning combinations that he appears in. 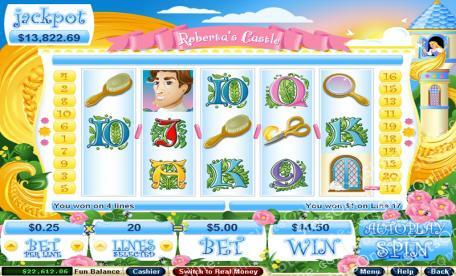 Roberta's Scissors and Hair Brush will pay out up to 2000 times your line bet, and the Cat and the Mirror will pay out up to 500 times the bet. Roberta's Window will trigger a free game feature in which prizes are tripled. If you can manage to spin three ore more of these icons, you'll find yourself adding to your treasure trove. Help Prince Charming get to his fair maiden. If you succeed, you'll walk away with a chest full of riches. Three or more of Roberta's Window anywhere on the board will trigger a free game feature in which you will get 15 free games. Prizes are tripled during this free game. Two or more scatters anywhere on the board will multiply your total bet. The debonair Prince Charming will substitute for all other symbols, excluding the scatters. Prizes will double if he appears in any winning combinations.